Colloquially, the difference between "can" and "may" has become blurred. Since the person is being so polite as to begin with "Dear Sir", "may" would be the proper term. Can I come in a little late tomorrow? I have an appointment at the medical clinic." "I don't know, but I'll bet you could if you tried." See the usage notes on can and may. Bank teller: Can you spell your name? Customer: Of course I can, I learned that in first grade. Seems we have a rather large BE/AE difference here. In BE "one of these days..." is really the OPPOSITE of "in the near future." So that when I read the text and came to that phrase I thought "What a nasty man!". His wife has just said she really liked that particular wine so much that she didn't even want to drink any of the other wine they already had - she just wanted that one again. (I'm taking a guess that's what you meant?) Then to say he'll get some more "one of these days" means he'll get around to it some time or other in the future. NOT soon. Because it also carries the nuance of "if I ever get around to it" "if I remember", "when it suits me" "maybe never". There is not really a difference. A well-known catchphrase of American television character Ralph Kramden, played by Jackie Gleason, is "One of these days... One of these days... (He shoots his fist up) POW! Right in the kisser!" The humor comes in the emptiness of the threat. "One of these days" never arrives. Ralph never hits anyone. Years ago one of my neighbours was a bus driver. Some matured lady once asked him (when he was waiting with his bus in the terminus station to start driving back to the east) when does the bus leave. With a sly and tranquil Savonian style he answered: "One of these days." Interesting. Ralph Kramden was a bus driver. Perhaps his response had a darker implication. Okay, I don't care about adjacent letters and keyboards. Does the following mean that no accident happened? He drove in to the Burger King last night. Right. It just means he used his car in order to go to Burger King. The word “into” is a preposition that expresses movement of something toward or going inside something else. What do you mean by "tube", thar? I see both usages in effect, but don't know the difference. 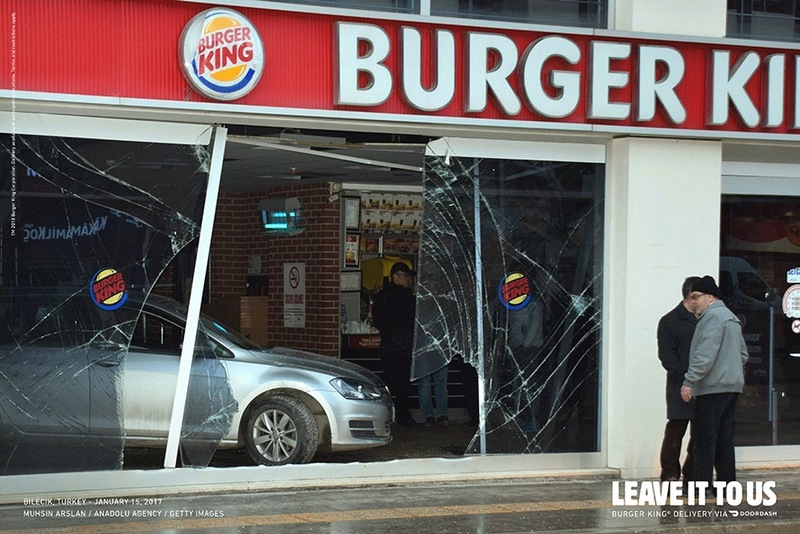 He drove into the Burger King last night. I can’t found the word leffing, I think maybe it’s phonetics for “laughing” or perhaps is a typo? 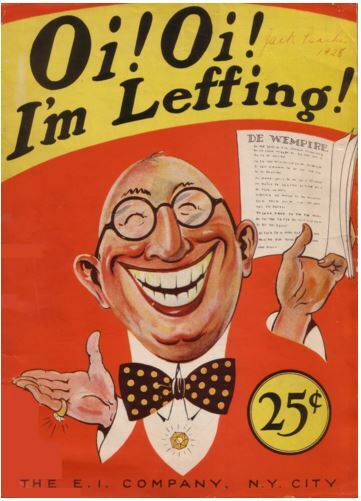 The word "leffing" is how "laughing" is spelled in Yiddish. Like many Yiddish words/spellings, "leffing" was used and known by the general public, including movie-goers. "And I am leffing." (http://www.archive.org/stream/modernscreen1213unse#page/60/mode/2up) The author is "leffing" or "laughing" at three acquaintances who were having trouble maintaining a good figure. Note this issue of the magazine is from 1936, the same year as My Man Godfrey. There are other examples of "leffing" from movie magazines of that era. Also note the description of the 1927 book Oi! Oi! I'm Leffing, (http://elmanhypnosis.com/product/oi-oi-im-leffing/), which says 'Half of this book is written phonetically so when you read it, you have a “yiddish accent'. Again, "leffing" is Yiddish for "laughing." Ernesto, you must have been reading the screenplay. It calls for a close view of a gossip magazine, which opens to show the article with the text you are describing. In the actual film, however, as the shot gets closer and the text of the article becomes less blurred, the last part cuts off at an angle, leaving everything after "everybody" out of the focused shot. That was a good find on your part, sp3lly, and probably explains why the screenwriter called for the fictional magazine to use "leffing". Topic: Is there any word or phrase to describe the situation of the parents? The daughters do not take care of their parents except their only son who does not know the whereabouts of his sisters, as their relationship is estranged. Is there any word or phrase to describe the situation of the parents? Strictly speaking, it is the sisters who are estranged, because their relationship to their parents and brother is distant. Topic: What does the word present mean ?? It sounds like corporate doublespeak to me. I read it as meaning something similar to "real soon now". 1. Supposed to be available (or fixed, or cheap, or whatever) real soon now according to somebody, but the speaker is quite skeptical. 2. When one's fortunes, fates, or other time commitments permit one to get to it (in other words, don't hold your breath). See also: "the check is in the mail". But aren't all the dictionaries related to TFD the American versions? Even of the Oxford? I certainly get very different answers from hard-copy English dictionaries in many instances than on TFD. So perhaps - as American society doesn't include titles, neither does that particular interpretation of "title" exist in American speech? Which particular interpretation of "title"? The OP concerned the name of a book, and whether it was "titled" or "entitled". In some dictionaries, "titled", in relation to a book, film or painting, is not listed separately, as is "entitled", but only as a past tense of the verb "title". The Cambridge Dictionary, without separating British and American English, does list "titled" separately, as an adjective, with separate definitions for "titled" in reference to books, films and art, and "titled" in reference to people. Reed wrote a novel about Sade titled "When the Whip Comes Down". So "The book titled 'Basic Buddhism' was printed in Chinese and English" is not incorrect, just a bit wordy. The other meanings of "titled" and "entitled" are sidetracks in relation to the original question. Topic: Which is the correct adjective? Either one. I like mystical better because it's always an adjective; it seems clearer. Mystic can also be a noun; as an adjective it sounds as if someone couldn't be bothered with the last syllable, like when people use disconnect in place of disconnection.